I am converting my car to 12 volt. I recently sent my 6 volt fuel gauge to D&M Restoration (800-722-0854). They put the face plate from my gauge on a 12 volt GM gauge, fits into the original gauge cluster and looks stock. I already had a 0-90 Ohm sender for the tank. With this set up it is an easy one wire connection between the sender in the tank and gauge. Thanks for the info, great that is available. Believe I have a short piece of broken tubing in a junk box that I removed from a parts car years ago, will use that for comparison at a hardware store. I have one piece, believe it is the one that goes against the steering box. 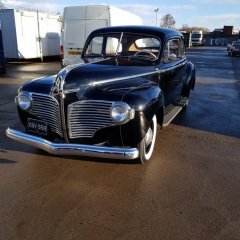 If anyone hears of a 39 Plymouth being parted out - let me know. Had my radio converted to 12 volt by "Old Car Radio", Charles Fogery, Harrison, TN. 423-344-8357. Works great, he added FM, leads for extra speakers and a jack for a Scandisk which I can easily transfer songs from the computer to. Through the Scandisk also have access to blue tooth for wireless speakers. What I am doing won't work for everyone, but it works for me.